. :::::::::::::::: 2006-2011 SUMMIT ARCHIVES ::::::::::::::::. 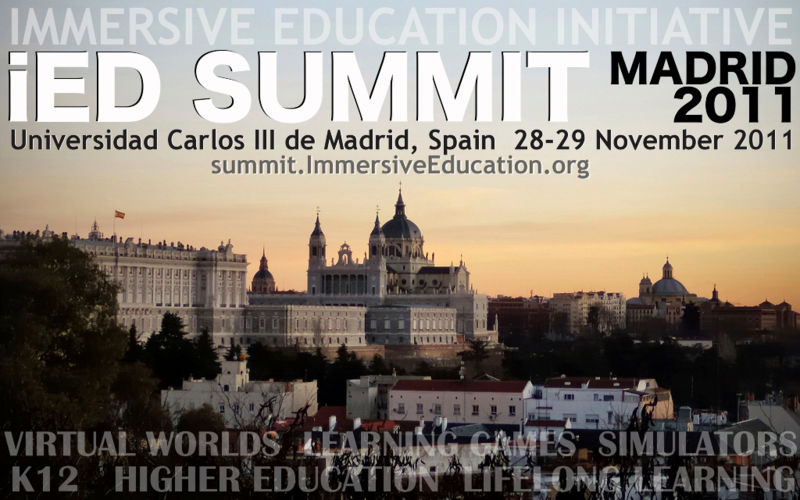 SPEAKERS: Speakers and panelists at Immersive Education Initiative Summits have included faculty, researchers, and administrators from The Grid Institute, Boston College, Loyola Marymount University, M.I.T. Media Lab, Harvard University, United States Department of Education, National Aeronautics and Space Administration (NASA), Federation of American Scientists (FAS), The Smithsonian Institution, Sun Microsystems, Duke University, Southeast Kansas Education Service Center, Immersive Education High School, South Park Elementary, Cornell University, Amherst College, New Media Consortium, Kauffman Foundation, Boston Library Consortium, Montana State University, Boston Media High School, realXtend (Finland), The MOFET Institute (Israel), University of Aizu (Japan), Royal Institute of Technology (Sweden), University of Essex (UK), Coventry University (UK), Giunti Labs (Italy) and European Learning Industry Group, Open University (UK), and more. SEE ALSO: Programs from previous Summits (see ARCHIVES below), related Immersive Education Initiative conferences and events in addition to our news, videos, papers and presentation archives. SPEAKERS: Speakers and panelists at Immersive Education Initiative Summits have included faculty, researchers, and administrators from The Grid Institute, Boston College, Loyola Marymount University, M.I.T. Media Lab, Harvard University, United States Department of Education, National Aeronautics and Space Administration (NASA), Federation of American Scientists (FAS), The Smithsonian Institution, Sun Microsystems, Duke University, Southeast Kansas Education Service Center, Immersive Education High School, South Park Elementary, Cornell University, Amherst College, New Media Consortium, Kauffman Foundation, Boston Library Consortium, Montana State University, Boston Media High School, realXtend (Finland), The MOFET Institute (Israel), University of Aizu (Japan), Royal Institute of Technology (Sweden), University of Essex (UK), Coventry University (UK), Giunti Labs (Italy) and European Learning Industry Group, Open University (UK), and more. SEE ALSO: Programs from previous (see ARCHIVES below), related Immersive Education Initiative conferences and events in addition to our news, videos, papers and presentation archives. POST-SUMMIT: . 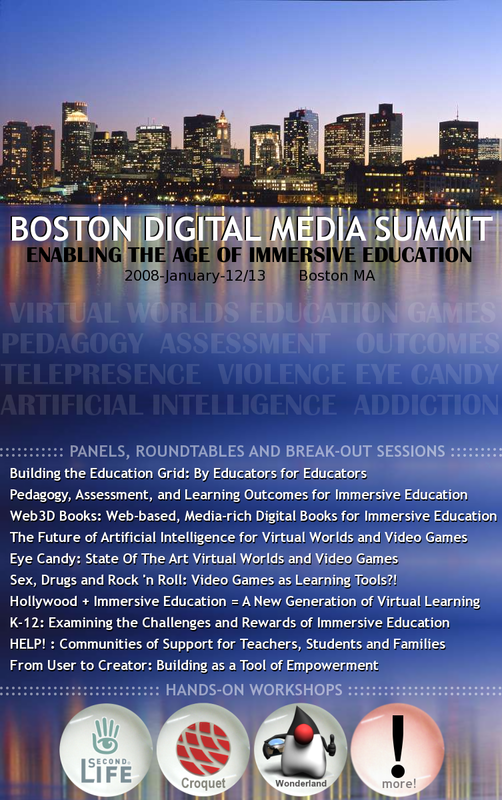 :: OUTCOMES OF 2010 BOSTON SUMMIT POSTED ::. OUTCOMES: . 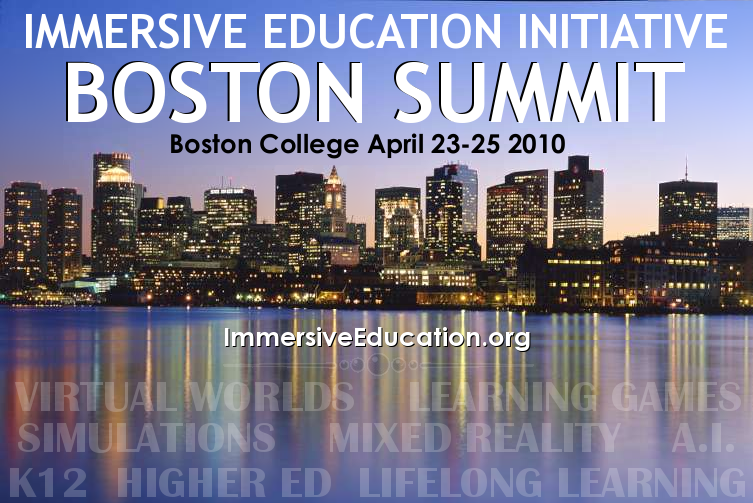 :: OUTCOMES OF 2010 BOSTON SUMMIT POSTED ::. SPEAKERS: Speakers and panelists at Immersive Education Initiative Summits have included faculty, researchers, and administrators from The Grid Institute, Boston College, Loyola Marymount University, M.I.T. Media Lab, Harvard University, United States Department of Education, National Aeronautics and Space Administration (NASA), Federation of American Scientists (FAS), The Smithsonian Institution, Sun Microsystems, Duke University, Southeast Kansas Education Service Center, Immersive Education High School, South Park Elementary, Cornell University, Amherst College, New Media Consortium, Kauffman Foundation, Boston Library Consortium, Montana State University, Boston Media High School, realXtend (Finland), The MOFET Institute (Israel), University of Aizu (Japan), Royal Institute of Technology (Sweden), University of Essex (UK), Coventry University (UK), Giunti Labs (Italy) and European Learning Industry Group, Open University (UK), and more. SEE ALSO: Programs from previous 2006-2009 Summits (see ARCHIVES below), related Immersive Education Initiative conferences and events in addition to our news, videos, papers and presentation archives. MAPS AND DIRECTIONS. The three-day Immersive Education Initiative 2010 Boston Summit convenes at 9am on April 23 in Murray Function Room in Yawkey Center on the Chestnut Hill Campus of Boston College. Use map (a) and directions (b) below to locate the Chestnut Hill Campus at Boston College. Once you are on the Chestnut Hill Campus use map (c) to locate YAWKEY CENTER (note that Yawkey Center is in Alumni Stadium). Also use map (c) to locate CORCORAN COMMONS, FULTON HALL, and GASSON HALL. 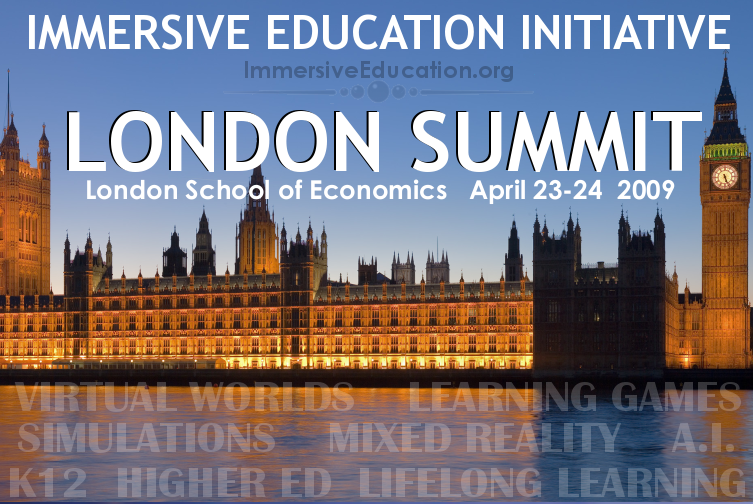 The two-day Immersive Education Initiative London Summit convenes at 9am on April 23rd 2009 in the Wolfson Theatre in the New Academic Building at the London School of Economics. COST: The per-seat cost of the two-day London Summit is £195 (pound sterling), or $275 USD (U.S. dollars). Seating is limited and expected to reach full capacity almost immediately after registration opens to the general public. STUDENTS: The London Summit is FREE FOR STUDENTS. To get into the London Summit free of charge as a student simply enter the registration code "2009-STUDENT-FREE-03-09" when you register and skip (ignore) the payment section of the registration process. Be sure to list the name of the person from your school who is also going to the London Summit (available seats first go to students who are from the same school as a faculty member, researcher or administrator who is also attending, so if you are from the same school as someone who is already attending be sure to list them in the registration form so that your free seat will be guaranteed). PRELIMINARY SPEAKERS: Preliminary speakers and panelists include faculty, researchers, and administrators from The Grid Institute, Boston College, Loyola Marymount University, M.I.T. Media Lab, The Smithsonian Institution, Sun Microsystems, University of Essex (United Kingdom), realXtend (Finland), Royal Institute of Technology (Sweden), BalticGrid (Baltic states), Holon Institute of Technology (Israel), Duke University, Montana State University, University of Central Missouri, Southeast Kansas Education Service Center at Greenbush, Boston Media High School, University of Aizu (Japan), Cornell University, Serious Games Institute, and more. View the London Summit program and schedule for details. Copyright Statement and Legal Notice.